According to Moonalice legend, the Goodyear blimp is the official bird of Redondo Beach. We have just one question: Does it taste like chicken? According to Moonalice legend, today is the 95th anniversary of Albert Einstein's Special Theory of Relativity. This is the one that demonstrated that the speed of light is the same for all observers regardless of the state of motion of the source. As theories in physics go, the Special Theory of Relativity is a face on Mount Rushmore. The Special Theory has been experimentally verified by many scientists, including a UC Berkeley graduate student named Ashkenaz Moonalice. Ashkenaz postulated that it is always 4:20 somewhere. The tribe has dedicated itself to proving Ashkenaz's Special Addendum to the Special Theory of Relatively. Generations of experimentation are conclusive, but we invite you to run the experiment at your convenience. 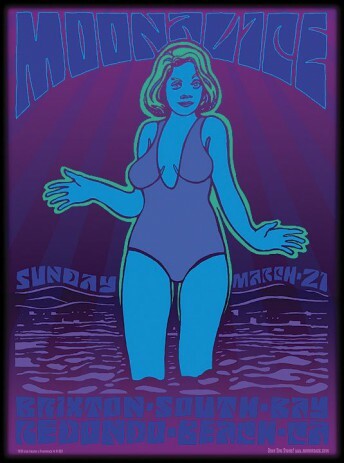 According to Moonalice legend, Redondo Beach was home to the first all women Moonalice bass orchestra in LA County. This was back in the 20s. Thirty-seven girls, each with a four-string bass, a G-string and nothing else. They were very popular until they played a gig at the Redondo Union High School and got busted by the PTA. According to Moonalice legend, today is the 58th anniversary of the first rock 'n' roll show staged by Alan Freed in Cleveland. Forty years ago, San Francisco held the 1st Earth Day. Do you know what element was common to both events? Hemp! And tonight we are gathered here together for the first. If you need any ideas about what to share, please speak to Big Steve.